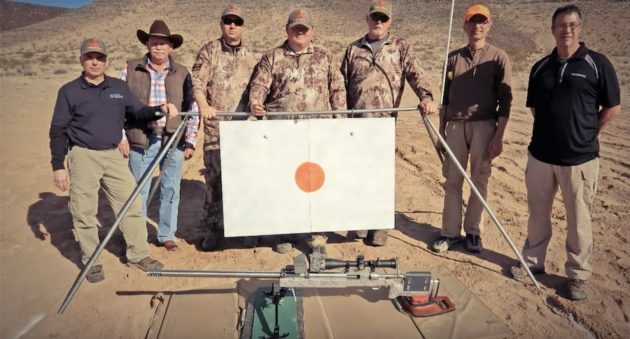 Renowned long distance shooter Paul Phillips successfully connected on a 6,000-yard shot using a custom rifle chambered in .416 Barrett. Bill Poor made big news in shooting circles when he successfully pulled off a 3-mile (5,280 yards) shot near Midland, Texas back in 2018. Well, Paul Phillips recently eclipsed that achievement with an eye-popping 6,000-yard shot on January 20, 2019. Phillips was shooting a custom rifle chambered in .416 Barrett firing 550-grain Cutting Edge bullets. His target was a steel plate 32" tall and 48" wide, 6,102 yards away. That shot required an additional 625 MOA of elevation from a 100-yard zero. As you can see in the video, 10 degrees of barrel angle was necessary to hit the target at that extreme range. Watch the video to see how it all went down. Just to give you an idea of just how far 6,000 yards is, even with a muzzle velocity of 3,000 feet per second, it still took those high BC Cutting Edge an astounding 17 seconds to reach the target! In addition to breaking Bill Poor's unofficial record of 3 miles, Phillips' 6,000 yard shot also surpassed the impressive shooting achievements of retired Navy SEAL SEAL Charles Melton (2.84 miles/5,000 yards) in 2017 as well as the Hill Country Rifle Team (3,800-yards in 2015 and 4,210-yards in 2016). Like what you see here? You can read more great articles by John McAdams on The Big Game Hunting Blog. Follow him on Facebook, YouTube, & Instagram.